Earlier in the day: It was not exactly a homecoming. True, I had spent a few of my adolescent years just an hour’s drive from here, during Dad’s BHEL Haridwar posting. However, the place had changed. Rishikesh, I knew was filthy and a bit stinky. India’s spiritual capital had a leap of faith. There were more foreigners than beggars. Even Indian tourists descended from privileged settings. A few adorning Guccis and Pradas. The place was swarming with seekers. We were away from the swarm. An hour or so upstream—Raga on the Ganges—a cozy resort tucked away in the foothills of the Himalayas. Our charter was river rafting. We were here to conquer Ganga, not God. The planned evening Aarti at Rishikesh Ghats was a sidekick. Later in the evening: The Aarti rendezvous at Parmarth Niketan turned out to be surprisingly stirring. It all started during a private audience with Stanford graduate Sadhvi Bhagwati. The intimate interaction is not a privilege accorded to commoners. Our white clad group was special. My wife, Ritu, is a member of Pune’s EO club (Entrepreneurs’ Organization). I had tagged along as a spouse for their club’s retreat. It was in this tailored sermon where Sadhvi taught us the trick of unpeeling our masks, “Our daily roles are like the different characters an actor plays while shooting. Just like an actor, we need to unpeel our role masks every night and sync back with our true self. When we disconnect with the world, we connect with our soul”. Sadhvi’s message lingered as we were escorted towards our VIP seating by the ghats. It was Ram Navami—Lord Rama’s birthdate. There were celebrity performers, led by Bhajan king Anup Jalota. 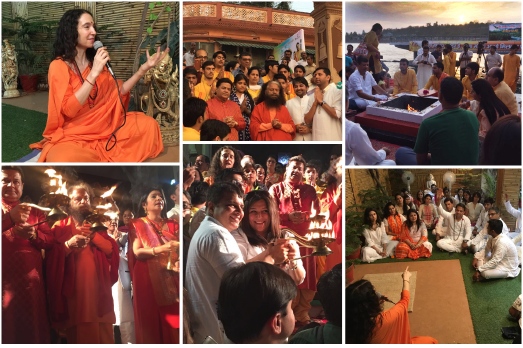 His holiness, Pujya Swami Chidanand was in full elements with his captivating discourse. Gushing Ganges. Dancing diyas. Havan bonfire. Resonating chants. Enchanting hymns. Orange-robed students. Setting sun. It was heaven! God must have been close by. My thoughts were far away. I was busy shedding my masks. But the external action kept interrupting my exercise. Midnight + 10 minutes: In the night’s quietness, I finally managed to peel away my masks. And then, something strange happened. The stillness lasted only a moment. Every time I got rid of my ‘masks’, they were back in a flash! Holiness was slippery. Doubts flooded. “‘Sadhvi’s message is jargon. Soul is an illusion. Divinity is a myth.’’— Some of my random thoughts as I snored away. Afternoon, next day: There were eight of us. Synchronized. Paddling furiously when the cliffs came perilously close. The waves were tossing our rubber raft. The rollercoaster ride only strengthening our resolve! There was no time to think. No time to socialize. We were co-travellers. That was our only bond. The rapids eventually smoothened. We all jumped into the Ganges. Quenching our thirsts with holy sips. Then floating with the current. The life jackets keeping us straight, our faces tilted towards the Himalayan skyline. A view that has stayed untouched for a millennium. It was like drifting through the waves of space and time. We were an extension of the river. The river was an extension of the mountains. The mountains were an extension of the sky. Everything was connected—the sound of the river, the chirping of the birds, and the laughter of my fellow floaters. I was a mute witness to my tiny identity in the vastness. All my roles—CEO, husband, father, son, and friend—were miniature links to the surroundings. Tied to everything, yet strangely free. The icy water had warmed up my soul. Sure, the quest of self-discovery is important. But how we pursue it is our choice. The spiritual path advocated by holy gurus is not the only option—I find it too abstract. I feel there are simpler ways. 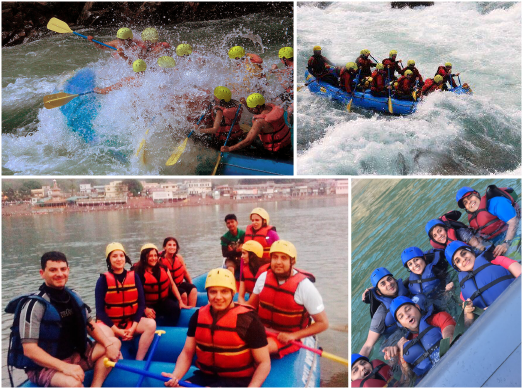 Be it a rafting adventure with friends, an invigorating board game with family, or a cultural activity with colleagues. Numerous social hobbies to bare our soul surround us. All we need is a zest for life to experience the liberation they offer. Connecting with self doesn’t have to be at the cost of disconnecting with the world. In fact, the closer our bond with humanity, the closer we are to self. After all, beneath the roles we all play, aren’t our souls identical? Do you have a ‘liberating’ hobby that you would like to put up as a contest entry? Please limit your response to fifty words or less. Let’s save the details for the dinner at my place . May be life has had a course where I don’t have liberty for in time real pleasures. I have only picture of my dad with me with whom I shared everything. All I need is go in past with him and his final responses are liberating enough for me. Mounted on a galloping horse is a feeling of extreme apprehension and exhilaration. Two bodies flowing in one motion, needs to be experienced. The powerful feeling while riding atop the horse constantly reminds the dependency on the animal; makes you feel so powerless. The fragile bond is so liberating….! For me currently its running. When your spirit has been thoroughly beaten by the elements, the road, the climbs and the dangerously moving traffic and you want to quit your run, that one moment when you decide to still continue to run is the most liberating moment for me. Books do the job for me. After a tiring day at office, I look forward to disconnect from reality, build those imaginary locales in my head, get to know the imperfections of the protagonist. Reading, is a journey for me. I rejoice knowing that there are countless books I’m yet to read, so many places I’m yet to build in my head, so many characters I’m yet to know. Absorbed in the pages of a good book, living the metaphoric descriptions makes me “shed my masks”. I am one with the character I connect with and together we meander through the journey until we meet the end. True liberation for me is an amalgamation of my personal fantasies with my favourite writer’s words that make my life a fairy-tale like experience. Very inspiring Arun. Self Actualisation/Discovery is the essence of life. Spiritual excellence is the fourth quadrant of life’s balanced scorecard apart from social, personal and work.Whether it is Maslow’s hierarchy or our Spiritual Gurus, all try to guide us there. Hoping I will crack the code some day assuming some has already done it in the past! Passion towards dance unifies me with my inner world because to watch us dance is to hear our hearts speak. You can dance anywhere, even in your heart. I see dance being used as a communication between the body and soul, to express what is too deep to find for words. “To each his own” – In each activity ranging from daily routine tasks to leaving our dreams, from working to achieve something in field of our interest/career/passion to fulfilling our responsibilities, having a constant feeling which tells that we are on the track and doing whatever we were born to do, leads to satisfaction. Satisfaction leads to a state where we don’t even need to think about getting liberated. This state will make our energy to resonate with the global/cosmic positive energy that flows universally and that resonance is the moment of our liberation. In a nutshell, a feeling of – “there is nothing left to do” – even while giving 100% – is liberation. My ‘liberating’ hobby – is to be with my family and make them feel liberated. The Life Thought me that, how much ever mask of responsibility being peel off but the soul character is been seen with the habits you have, the work you do, and the humbleness you carry. For me Falling tears is liberating, I let it go, when I see some good or hear some bad, people call it EMOTIONAL. However I am pondering on some questions like can every mundane action (say driving a car or having food) can lead us to same state of freedom that we enjoy while undertaking “liberating” hobby? Do we really need some external thing like hobby to feel free? I watch 3+episodes of various TV serials or a movie every single day. I really feel happy and connected with those imaginary yet very amazing creations. That is a cool exercise 🙂 . Mindful meditation does it for me. All I need to do is breath. Being able to dissolve time and space and confines of body is nice. Away from civilization with limited resources, with a bunch of folks I go through an amazing ride for the duration of the trek. Experience different things like value for available resources, bonding among people while on steep mountains and the bond changing as soon as we are on safe ground. In one such trek uncertainty struck, it was supposed to be a two day trek. We were supposed to go on Saturday morning and come back Sunday evening but we lost way and only came back Monday night. It was an experience, with gods grace we all came safely so it remains an experience or else it would be a nightmare. Amazing article , theory of removing mask while connecting to inner self is seems to be so correct. Another thought which came to me after reading this , why do we get so much engrossed in the roles firstly that we have to remove the mask .I know its very difficult to live connected to people wearing different hats while we play different roles in life and yet keep our self focused to inner being . This seems to be KEY for inner progress –ULTIMATE CONTENTMENT. Life is short, so help more people. This is the most liberating hobby for me. I never gave a serious thought to pursuing self-discovery, until something very close to it hit me like a thunderbolt. I took up Cycling as a lifestyle choice almost half a year ago. I decided to do an endurance ride on my MTB (not a good choice). Started for Mahabaleshwar with all the science of cycling I could cram in my head. After 80 kms, I was about to fall of exhaustion, but that’s when the strange music started. All my calculations about energy-nutrition-stamina went down the drain and I suddenly started pedaling with a new found vigor. I reached Mahabaleshwar and found a grassy spot to lie down on. That’s when I realized I just had a “Cyclist’s high” (much like a runner’s high). I don’t know about self-discovery so much, but I definitely knew more about myself from that point on. I started running few years back just for fitness but now it has become an integral part of me. Running to me is a road to self-awareness and reliance where I can push myself to extremes and learn the harsh reality of physical and mental limitations or coast quietly down a solitary path watching the earth spin beneath the feet. Sometimes at long distances (at 25-30 km) body argues that there is no justifiable reason to continue. The only recourse is to call on your spirit, which fortunately functions independently of logic. At that point even when I’m alone or with a group or a marathon event where I’m just me without any of the multiple masks that I wear in a day (engineer, son, brother, friend), there comes a time where I can just hear my heart beating and I listen to my mind to carry on…that’s the moment of liberation. Since last 20 years I have done a few things to liberalize myself. 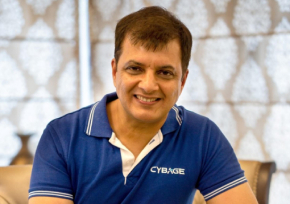 It all started from doing a lot of exercise, running … I also attended Vipassana meditation, which involves rigorous training like maintaining noble silence for continuous 10 days. They all helped me some way or the other but one thing which helped to forget everything was swimming. During swimming, I forgot everything; it disconnects me from the world and re-connects to self. I must say, this is yet another insightful and inspiring blog from you! I am fortunate enough to have a good exposure to professional theater and dramatics since early years of my life. This hobby helped me do multiple role plays- think, behave and live a new life that of a character I am portraying on the stage. Every time, I was working to best of my abilities to understand the behavior pattern and unique personality traits demanded by new character identity on stage, I started learning more about myself. The more I got connected with my new identity and the larger audience, the closer I was to myself. It is certainly the best way so far for me to experience the liberation that a hobby can offer. You have aptly put up both meditation and sport as a way of liberating the self. For me, it is daily 20 min meditation & pranayam. I am still a starter in meditation and masks/thoughts are coming back very quickly but the serenity of these 20 mins makes my day wonderful. & I am ending my day by writing daily journal. It just take 15 mins to quickly revising the day identifying little little achievement/happiness and misses of the day. This keeps me consistent, rooted and calm. There are plenty of ways to be with self and choose one as per your comfort. The time I spent with her takes away all the negativity around me and guides me to become a better person everyday. Nice blog and very deep observations Arun sir! For me, the most liberating hobby currently is to play with my little son. It helps me forget everything and just connect with my inner self. Apart from that, I find reading very comforting. My liberating hobby is doing Yoga. Its fantastic to push your muscles to extreme and then Just do nothing by closing Eyes. Liberation is not about seeking a new world or going to heaven. Heaven is just a new world where everything is supposed to be better than here. Even if it is a little better than here or much better than here, after some time you will get bored with what’s better. A lot of people living in remote places think America is fantastic. But people in America are pretty bored. Otherwise, why such a big entertainment industry? What is new will become old within 24 hours if you have a very active intelligence. If you are a little dull, it may take 24 years but it will get old. New is a trap, old is a cesspool. If you jump out of the cesspool into a new trap, that’s not going to help. Spirituality means you are not looking for something new, you are looking for liberation from all that is old and new. There are lot of stuff which liberates me from all the roles I am playing and take me towards real me. To name a few, Reading books/articles (mostly spiritual and motivation ones), Listening Soulful music, playing with kids or being in discussion/reading/hearing out senior citizens/distinguished personalities about their ideas/experiences about different aspect of life, seating quietly at river shore or looking at the crowd from roof top. This helps me to re-think same question again and again – “What to do next” or “Where to go from here”. Spirituality is all about connecting with your real self. This can be achieved and eternal happiness can be gained. Emptiness of the mind is the key to reach this stage. For example when I eat Gulabjamun for that moment I become happy because at that moment my mind thinks nothing. The happiness lies not in Gulabjamun but in the emptiness of my mind at that moment. This moment cannot long last unless we take efforts for the same. Doing anything for others with selfless motive and with the understanding the oneness between all human beings is also a simple way to connect to your real self and the almighty. (Atma and Paramatma). I find doing what I do… liberating. Just being at work and having the opportunity to contribute positively, to interact with bright minds, to learn everyday. Or being a good colleague, a daughter, a wife and a mother. I feel blessed and privileged for life has been kind to me and just that feeling that gratitude… is liberating. I do pursue other hobbies like playing a guitar, photography, reading, traveling… but what I find most liberating is to experience life to its fullest in every form … at every moment … like they say “Carpe Diem”. Yes, indeed, we are not these bodies, but pure spirit souls ! !